Vice President Dr. Bawumia has lauded the very important role Civil Society Organisations (CSOs) have played and continue to play in the growth and sustenance of democracy in the world, especially in Africa. 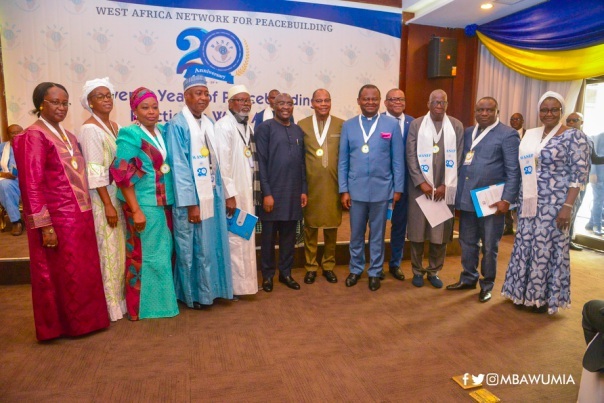 Vice President Dr. Bawumia acknowledged the important role played by CSOs when he gave the keynote address at the 20th Anniversary celebrations of the West African Network for Peacebuilding (WANEP) in Accra on Tuesday 26th March 2019. The celebration is under the theme “Twenty Years of Peacebuilding Practice in West Africa,” and brought together officials of WANEP from across Africa, as well as organisations dedicated to the promotion of peace and security. Vice President Dr. Bawumia urged governments and businesses to support the activities of CSOs, pointing out that a peaceful environment is a prerequisite for businesses to thrive. “The business community should consider sustained investments in peace and security through professional CSOs. This type of investment transcends the usual corporate social responsibility and in fact, should form part of the annual budget of business organizations. Also speaking at the event, Dr Mohamed Ibn Chambas, the United Nations Special Representative of the Secretary-General for West Africa and the Sahel, and head of the United Nations Office for West Africa and the Sahel (UNOWAS), celebrated the WANEP’s “invaluable contribution” to peacebuilding across the West African sub-region and beyond, saying it was a reflection of the crucial role CSOs continue to play in sustaining peace. Meanwhile, 16 renowned peacebuilding and conflict resolution experts have been unveiled as Peace Fellows of the College of Peace under the auspices of WANEP. The Fellows were sworn into office by Vice President Bawumia.